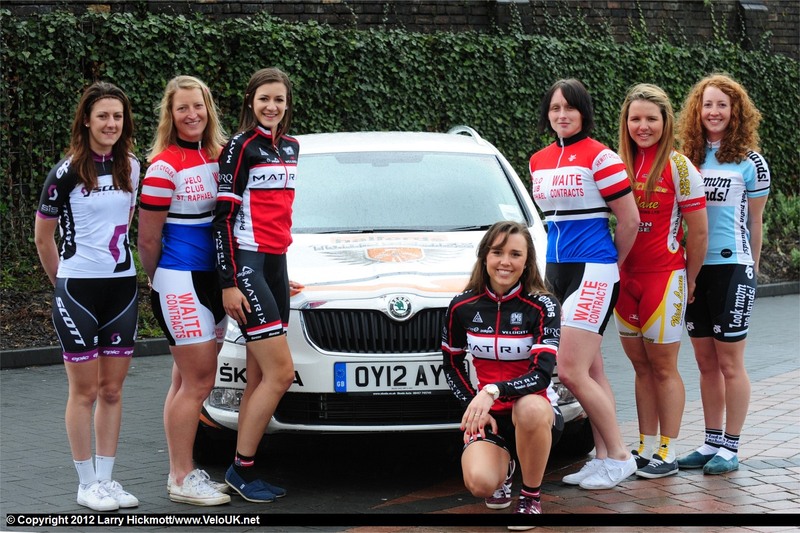 On Thursday the 19th of April Tom and I drove to Stoke on Trent for the launch of the Halfords Tour Series and the women’s series – Johnson Health Tech GP. 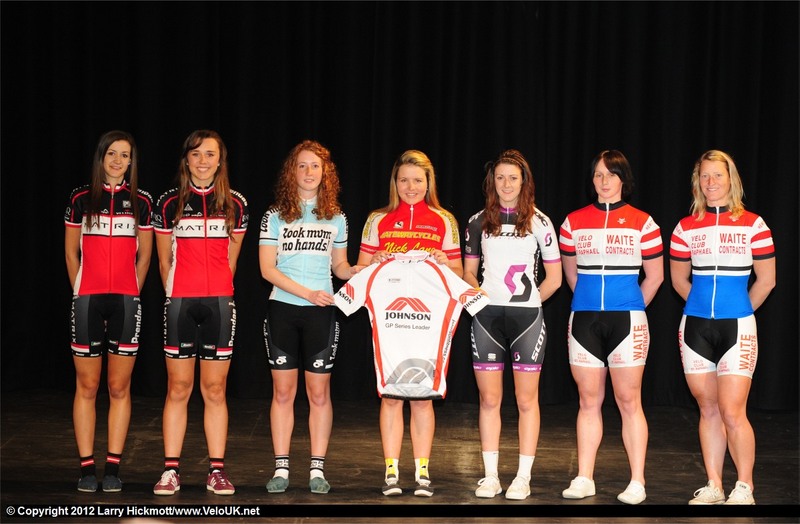 The men’s and women’s teams being presented.Men: L-R: Ian Wilkinson (Endura Racing), Tom Murray (IG Sigma Sport), Mike Northey (Node4 – Giordana Racing), Daniel Holloway (Raleigh GAC), Niklas Gustavsson (UK Youth), Tom Barras (Metaltek-Scott), Russell Falder (Cycle Premier Kovert), Jack Cutsforth ( Herbalife LeisureLakesBikes), Paul Oldham (Hope Racing) and World Team Pursuit Champion Andy Tennant (Rapha Condor Sharp)Women: L-R: Penny Rowson and Hannah Walker (Matrix Fitness-Prendas),Adel Tyson-Bloor and Jo Tindley (VC ST Raphael), Alice Miller (Look Mum No Hands), Lauren Creamer (Abergavenny RC) and Bethany Crumpton (Scott Epic). Highlights of the Johnson Health Tech Grand Prix Series will be shown on ITV4 as a part of The Halfords Tour Series highlights on the channel. After the presentation in the Mitchell Arts Centre the team representatives all came outside for a few more photos with the cars. 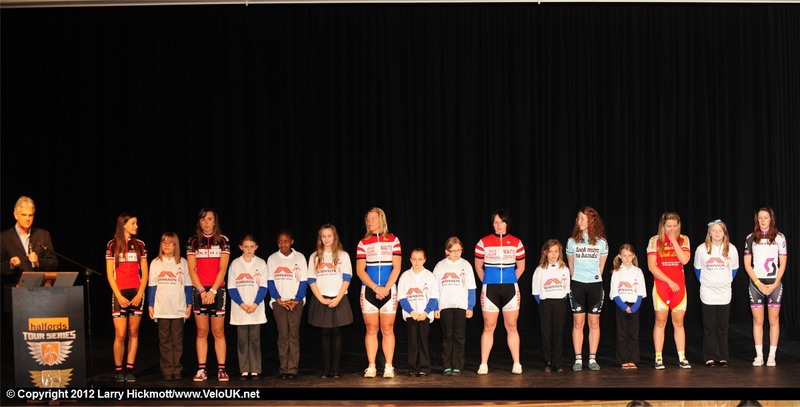 It was great to meet the other girls and to wander around amongst all the stars of cycling. 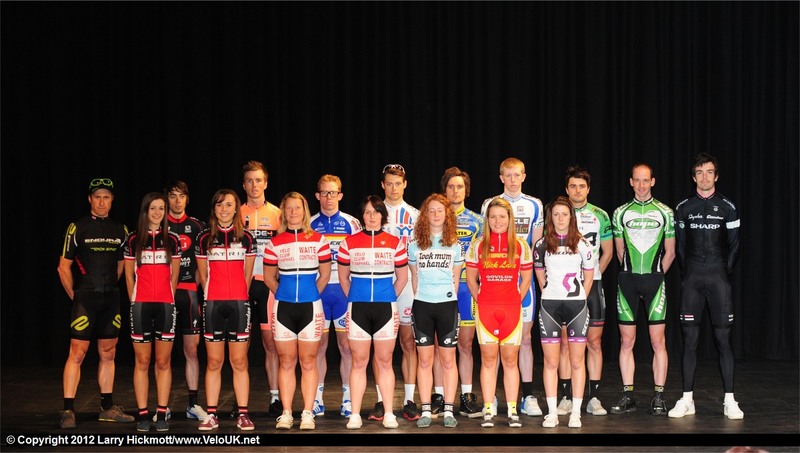 Beth is the current junior national XC champion, there also were Madison and Derny champion Hannah Walker, Andy Tennant who is World Team Pursuit Champion and ‘Superman’ Ian Wilkinson in amongst all of the other super riders who will be tearing up the streets of city centres all around the UK. I am looking forward to the first round of the JHTGP in Oxford!! Thank you to Larry Hickmott for the use of his great photos from the day. You can read a full report of the launch on his website VeloUK at this link and read more about the Johnson Health Tech Grand Prix here. We were all assigned a mascot each from a local primary school to look after us on stage.